Obviously, it costs to operate this sanctuary. There are food bills, veterinarian bills, cages and carriers, toys and perches...all the things birds need. Then there's the cost of traveling to pick up birds and to take them to new homes. 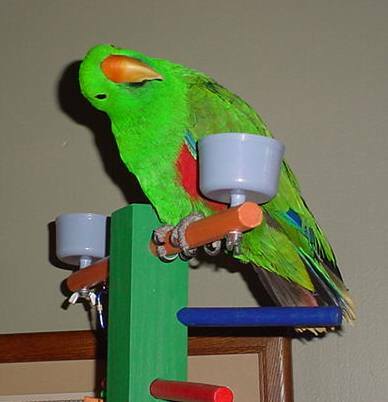 Iowa Parrot Rescue charges no adoption fee, We usually send the bird's cage, toys, etc. with it when it's placed.
. We gladly accept donations. We are a 501c3 tax exempt public charity, and donations are tax deductible. We mail receipts for tax purposes to all donors. If you'd like to endow a specific function, such as a fountain, play area, or something like that, we'd be happy to discuss it with you. Paypal no longer includes mailing addresses when they notify me of donations. If you donate via Paypal, and would like to receive a receipt and card, you'll need to drop me an email with the mailing address. Want to know where the money goes? Click HERE to see our financial reports. While you're shopping on AmazonSmile, you can also see OUR WISHLIST , and buy directly for the birds from that.